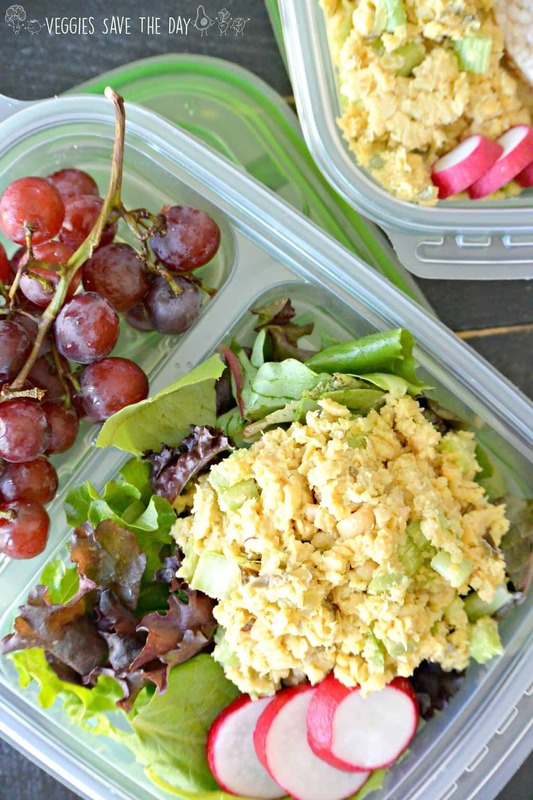 Vegan Tuna Salad is an easy and affordable back-to-school lunch. You can make a batch for the week and enjoy it on a bed of greens, with brown rice cakes, or on a sandwich. It’s vegan and gluten-free. 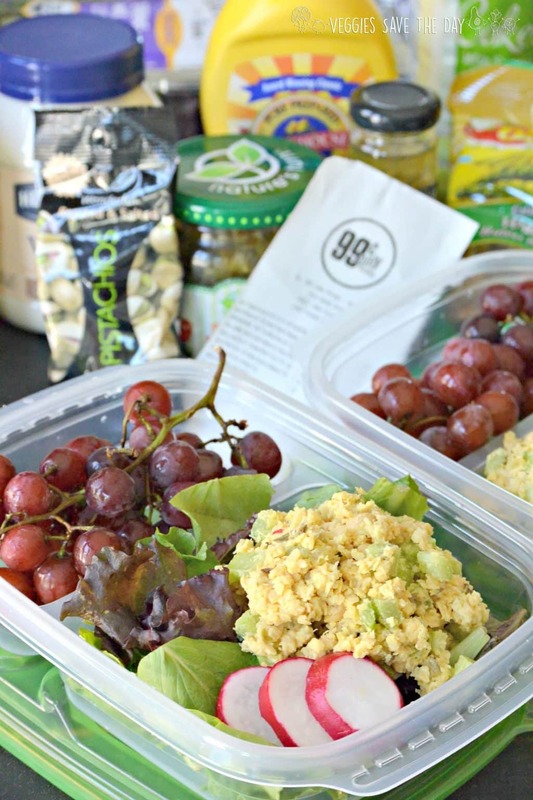 Do you ever struggle with what to pack for healthy lunches that won’t cost a fortune? Fortunately I’ve discovered how to stay on budget by shopping at the 99 Cents Only Store. They make eating healthy nutritious meals affordable for everyone. I saved so much money by shopping at the 99 compared to other markets. 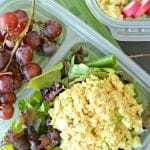 It inspired me to share with you how to save money on your favorite name brands and enjoy healthy back-to-school lunches, like vegan tuna salad. 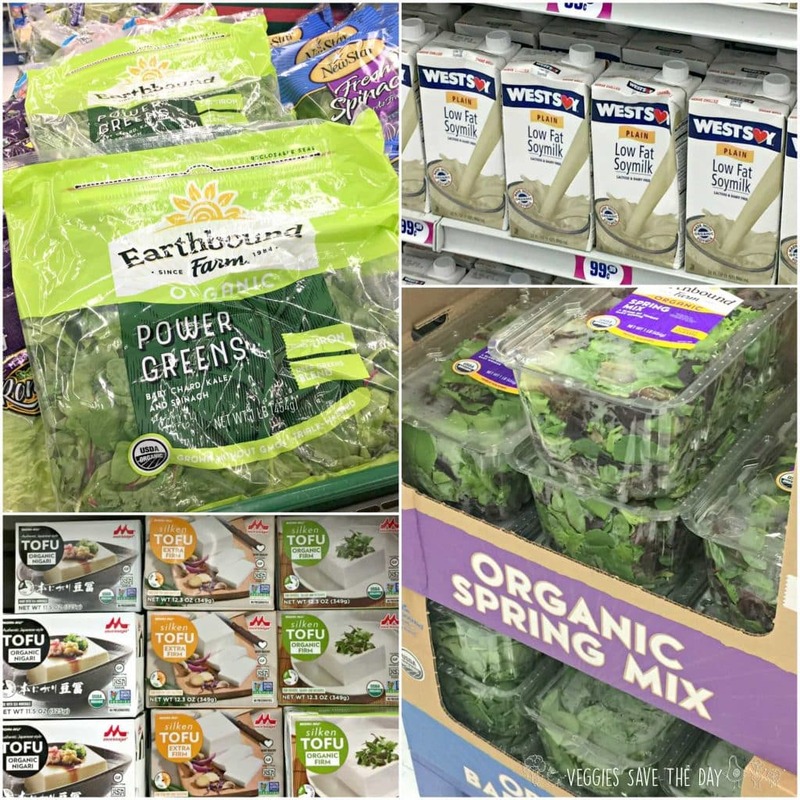 Check out all the delicious bargains I found! Everything you see here from the 99 cost 99 cents (or 99 cents a pound for the grapes). 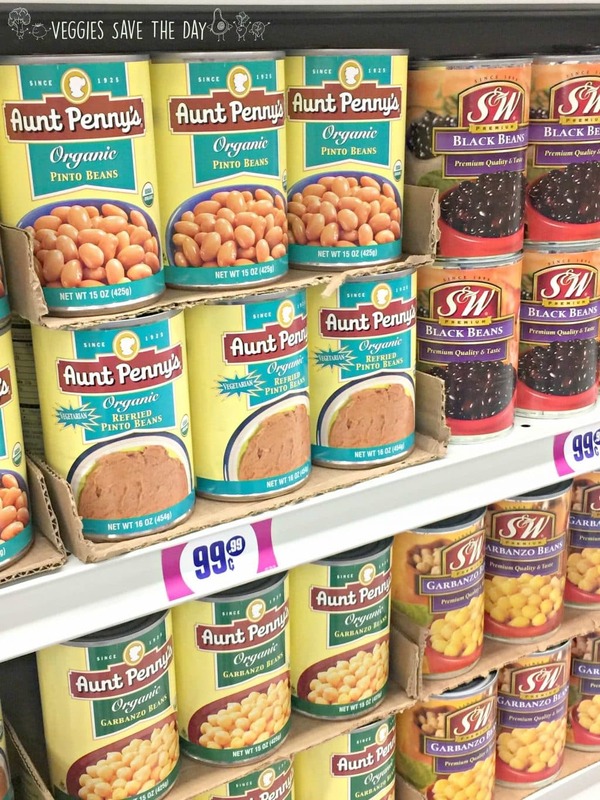 Even that jar of fancy capers was only 99 cents! And did you notice all the organic products? That’s right! You don’t have to be wealthy to eat healthy. I used what I bought to make a delicious vegan tuna salad. It really resembles the tuna salad I grew up on using only a few ingredients. I like to eat it on a bed of organic spring mix or with brown rice cakes. Also I picked up some snacks to go with it: radishes, red grapes, mango, walnuts, and pistachios. 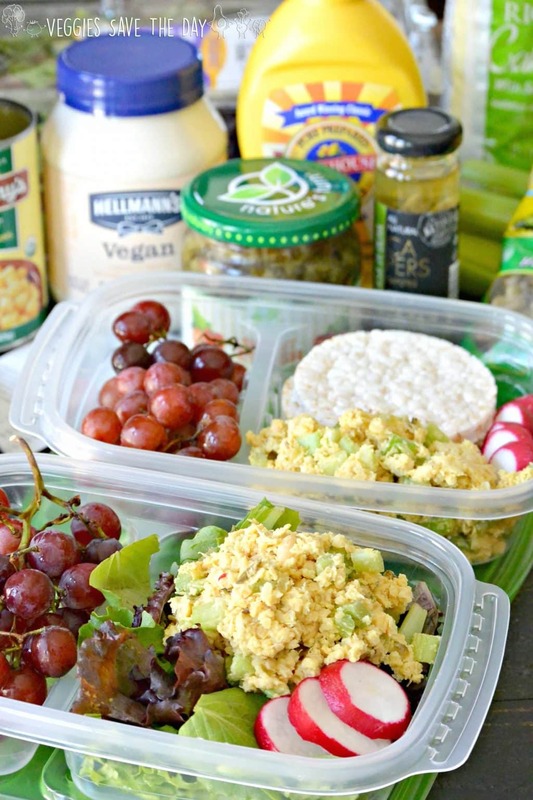 So by making the vegan tuna salad one day, you can enjoy a healthy lunch plus snacks every day of the week! I even got these great divided BPA-free lunch containers there, two for 99 cents! What a great way to #99yourschoolyear. In addition, I enjoyed walking down each aisle discovering all the foods I purchase at other stores for a lot more. I was very impressed by the selection at the 99. I will definitely be coming back for more beans when I make recipes such as Middle Eastern Bean Salad (Balela), Tropical Chickpea Salad, and Cilantro Lime Rice and Black Beans. In fact, I can get all the ingredients I need for these dishes when I do the 99! And look at these other staples I found! For those giant containers of Organic Spring Mix or Organic Baby Spinach, I normally pay at least 5 times as much! And at least 3 times as much for the non-GMO soy milk. So now I know where to go to buy ingredients for healthy lunches which I’m excited to share with you! 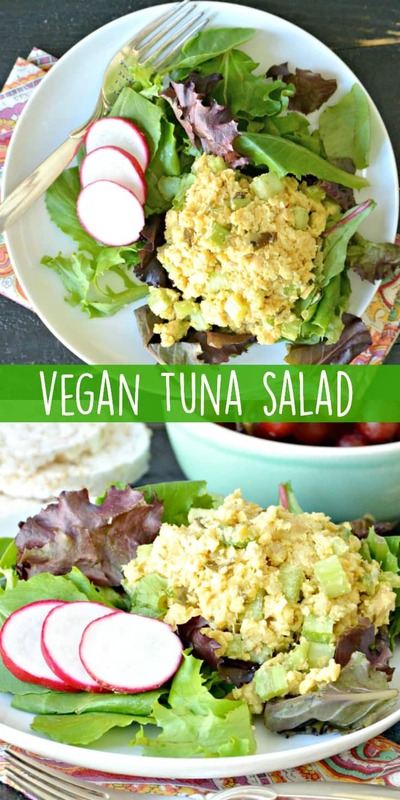 Even if you don’t have children who go to school, you can still enjoy this vegan tuna salad at home. 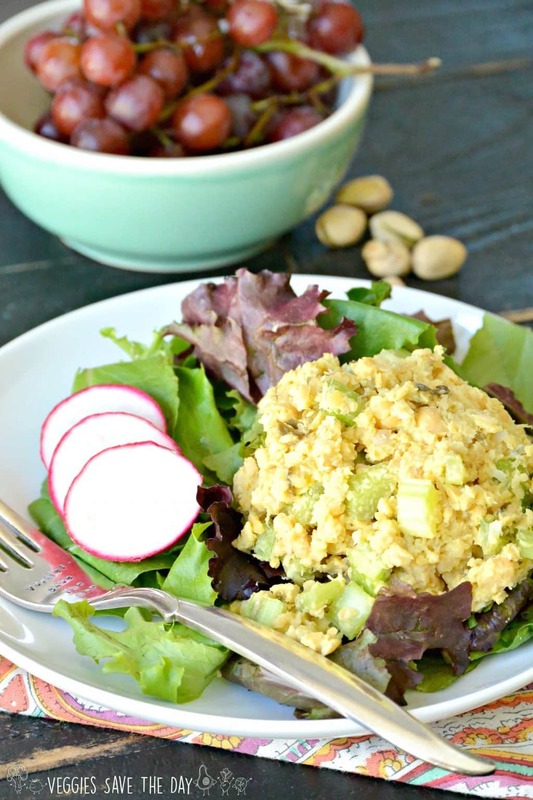 It’s so convenient to make a batch of vegan tuna salad and have it ready to enjoy when it’s time for lunch. Just mash up the chickpeas with some vegan mayo and mustard, and stir in the pickle relish, chopped capers, and celery. The capers really give it a seafood-like taste without being overly “fishy”. Then choose if you want to eat the “tuna” chickpea salad on a bed of greens like I did here, or as a sandwich on your favorite bread. What are your favorite make-ahead lunches? What are your experiences finding affordable healthy foods? Would you like to learn more about eating nutritious plant-based meals on a budget? And if you’re looking for more recipes that travel well, try Marinated Artichoke Hearts Pasta Salad or Waldorf Salad. You can find all the ingredients you’ll need for a great price when you’re #doingthe99! Now let’s make Vegan Tuna Salad! 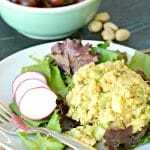 You can make this Vegan Tuna Salad ahead of time to enjoy for lunches throughout the week. 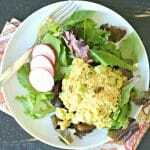 Serve it on a bed of mixed salad greens, on a sandwich, or with brown rice crackers. Feel free to add other ingredients such as chopped carrots, bell peppers, or olives. Add the rest of the ingredients to the bowl and mix until combined. Wow!! Can’t believe all that organic produce and products! So impressed. We don’t have a 99 cent store unfortunately. We do have a few dollar stores nearby though and you’ve inspired me to go wander those aisles to see what I can find! I know! You never know what you can find. It’s really fun, too. Like a treasure hunt! I don’t kno where y’all shop, but there isn’t n e dollar store that has produce where I’m at, let alone organic produce. That’s too bad. All the “99 Cent Only” stores have a fairly large produce section that includes some organic. Thanks, Mary Ellen! I love it for lunch. I need a 99 cent store in my life! So many great finds! 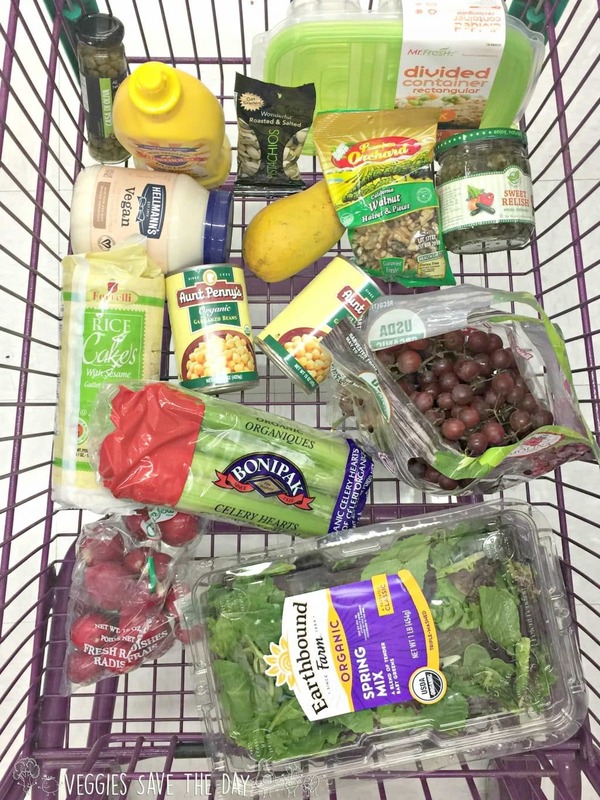 99 cents for organic produce and all of your other finds is pretty amazing. And this salad? Definitely making it. Lunch is always a struggle for me and I’m always looking for new school lunch ideas for my kids to keep them excited about their lunches. Thank you! Thanks, Gwen! I hope the kids enjoy it. Hopefully you can find a store like this where you live. Thank you so much, Gwen! You made my day! Thank you, Jasmine! The world is really changing! Vegan “tuna” has always been one of my favorite lunches. I love that you were able to find so many great products at the 99¢ store! I need to keep my eye out for those containers. Thanks, Dianne! It’s fun shopping there because you never know what you’ll find! Thanks so much, David! The 99 is a really fun place to shop. I really love the 99 cents store! But I always buy stupid things I will never use because they’re so cheap! p.s. Your logo is so cute. Ha! Yes, they have some fun stuff at the 99! YUM! I make a “tuna” salad that’s similar to this and it’s so good. There’s no need to eat fish when you can use chickpeas. I love the lunch boxes! No, it won’t be a good freezer option. But it is easy to make in a dorm room. What is the serving size for the nutritional info? Thanks! Hi Brynn! The recipe makes 5 servings. I tried this yesterday and it was pretty good….a keeper. I’m not sure what vegan mayo is, and I used a mayo with avocado oil, but ideally, I’l like to find a non-oil substitute for it. Hi Dawn, Vegan mayo is made without eggs. This is one of the best lower fat “tuna” recipes. I did add more capers to to pump up the saltiness, (3oz jar). I also used my Cuisinart to mash everything. Amazing.